As our pets age, they face the same aches and pains as the rest of us. camera (Ana Pereira/AP Photo) Bino, the albino alligator, receives acupuncture treatment in Sao Paulo, Brazil, Aug 27, 2013.
intro: As our pets age, they face the same aches and pains as the rest of us, including arthritis or scoliosis. And veterinarians, animal owners and even zookeepers are increasingly taking medical treatments designed for people and using them on aging animals to ease their pain. We've put together a list of the five most surprising medical treatments used to treat animals. 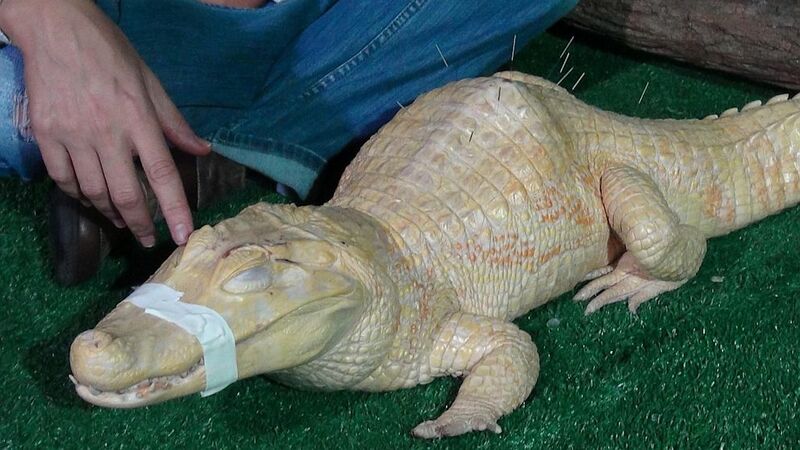 quicklist: 1 category: Animals Getting Human Treatments title: Bino the Alligator gets Acupuncture	url: text: Turns out even the scaliest skin can benefit from acupuncture. For years Bino, an albino alligator, couldn't get relief from his scoliosis, and other ailments that left him barely able to move his tail. This year Brazilian zookeepers started to administer weekly acupuncture treatments and found that a few well-placed needles helped to dull the reptile's pain. And Bino wasn't the only animal to receive the treatment. Simon Flynn of the American Academy of Veterinary Acupuncture told The Associated Press that there had been a 50 percent increase in veterinarians among the society's membership over the past few years. "There are many zoo veterinarians who use acupuncture, a number of equine practitioners who treat race horses with acupuncture, it's proven to be a useful treatment," Flynn said. "It's common with dogs, and it's becoming increasingly common with cats. More veterinarians are seeing the worth of the treatment. quicklist: 2 category: Animals Getting Human Treatments title: Animal Chiropractors Fix Spines and Tails Out of Alignment url: text: If too much tail-wagging has put your dog's spine out of alignment, you can always turn to an animal chiropractor. Not only will these specially trained chiropractors treat dogs and cats, but some will make house calls to treat show horses, guinea pigs, turkeys, even elephants. Rod Block, an animal chiropractor in Southern California, wrote a book called "Like Chiropractic for Elephants." "I really want to illuminate the differences between what allopathic (mainstream) veterinary medical care does and what chiropractic does, and how the two integrate well even though they are at opposite ends of the pole," Block told The Associated Press. Fans of animal chiropractors say putting the animal's spines into alignment can help with pain or limited mobility. quicklist: 3 category: Animals Getting Human Treatments title: Vet Recommends Medical Marijuana for Animals url: text: After seeing many animals in pain get euthanized, one Los Angeles veterinarian recommended that pet owners treating ailing animals with medical marijuana. Doug Kramer told The Associated Press that medical marijuana could help ease an animal's pain if the animal has cancer, similar to how it's used in humans. Kramer is part of a growing movement of veterinarians and pet owners who have found that small amounts of medical marijuana can help pets regain their appetite and give them relief from pain. "I grew tired of euthanizing pets when I wasn't doing everything I could to make their lives better," he said. "I felt like I was letting them down." While experts caution that there have not been studies on the effectiveness of the drug, some pet owners swear by it. Laura Bugni-Daniel told The Associated Press that she gives cheese with a does of marijuana to her elderly bulldog every night. "It's really nice to see your sick pet, for his last moments or weeks or months, be happy and not real sick and dealing with needles and surgery," Bugni-Daniel said. quicklist: 4 category: Animals Getting Human Treatments title: Vets Treat Aging Dogs With Lasers url: text: Even the most energetic of dogs can lose the spring in their step with age. But now veterinarians are using cold lasers to help ease joint pain in older dogs. Using technology originally designed to help athletes overcome inflammation and pain, veterinarians can help animals become more mobile again and enjoy a few more games of fetch. Bill Dougherty took in his German shepherd Rex for laser treatments at the Village Animal Clinic in North Palm Beach, Fla., after Rex experienced shoulder pain and started limping. "We always say that Rex is going to the spa when he goes to get his laser treatment," said Dougherty. "He used to hate going to the vet, but now he loves it. It's where he can go to relax and listen to Beyonce." quicklist: 5 category: Animals Getting Human Treatments title: Arthritic Otter Shoots Hoops url: text: For people who have from arthritis, a daily exercise routine can actually help reduce pain and stiffness in the joints. This advice apparently also works for otters. At the Oregon Zoo in Portland, Ore., zookeepers were worried that a sea otter named Eddie wasn't getting enough exercise to help soothe his arthritic elbows. Eventually, Jenny DeGroot, the zoo's lead sea otter keeper, figured out how to get Eddie to exercise his elbows, he could shoot hoops. "We had to get creative," DeGroot explained on the Oregon Zoo's website. "There aren't many natural opportunities for Eddie to work those arthritic elbow joints, because sea otters don't use their front limbs to swim. They swim by moving their back legs and flippers."